A number of the “old-fashioned” traditions mentioned in “Christmas Eve” have survived until today: Christmas caroling from house to house, hanging mistletoe from the rafters, and burning a Yule log (or clog). 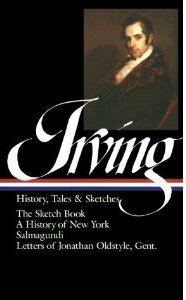 Yet they were unfamiliar to Americans in 1820, so Irving had to explain them in the text or in footnotes. Irving’s story lists a number of games that have been forgotten or transformed—some of which seem potentially painful. “Hoodman blind” is now familiar to us as blind man’s bluff (or buff). In “shoe the wild mare” each participant sat on a suspended plank and tried to hammer its underside a given number of times without falling off. The victim in “hot cockles” was struck while blindfolded and then had to guess who did it. In “steal the white loaf,” a chunk of bread or cake was placed on the table and a designated person sat facing the table while others tried to steal the loaf without being caught or identified. “Bob apple” differs from the modern version: instead of floating in a tub, the apples were hung by strings from the ceiling. And in “snap dragon” revelers grabbed raisins from a plate of blazing brandy and extinguished the burning fruit in their mouths. Irving also mentions a proscription that might strike some readers as peculiar: he is delighted that “minced pie” is available at the feast, “perfectly orthodox” so that he “need not be ashamed of my predilection.” Because mince pie (or “Christmas pie”) was long considered a Catholic tradition, many conservative Protestants considered it anathema; it was actually banned in 1657 during the English Civil War by Oliver Cromwell’s Puritan Council and it was still frowned on by some British citizens when Irving published his book. Within a few years such reservations were set aside by virtually everyone on both sides of the Atlantic, and mince pie became a popular addition to the Christmas meal. Notes: The epigraph is from William Cartwright’s comedy The Ordinary (c. 1635). Also on the opening page, the Squire is said to prefer The Compleat Gentleman (1622) by Henry Peacham to the more recent Letters to His Son (1774) by Philip Dormer Stanhope, fourth earl of Chesterfield. Both books concern manners, education, and (particularly the latter) keeping up appearances. The quote on page 926 about mongrels is from Oliver Goldsmith’s The Vicar of Wakefield; the lines following, about little dogs, are from King Lear. The footnote on page 929 contains a stanza from “Ceremonies for Christmas” (1648) by Robert Herrick, whose “The Night Piece, to Julia” is included in full a few pages later. On the last page, the narrator falls asleep to the sound of waits, or Christmas carolers accompanied by musicians. It was a brilliant moonlight night, but extremely cold: our chaise whirled rapidly over the frozen ground; the post boy cracked his whip incessantly, and a part of the time his horses were upon a gallop. 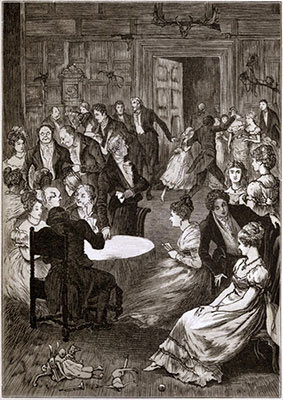 “He knows where he is going,” said my companion, laughing, “and is eager to arrive in time for some of the merriment and good cheer of the servants’ hall.” . . . If you don't see the full selection below, click here (PDF) or click here (Google Docs) to read it—free!